All hardware included, was going to paint it and use it but I don't have time. Should bolt right into your ranger. $150 takes it - you pay shipping. 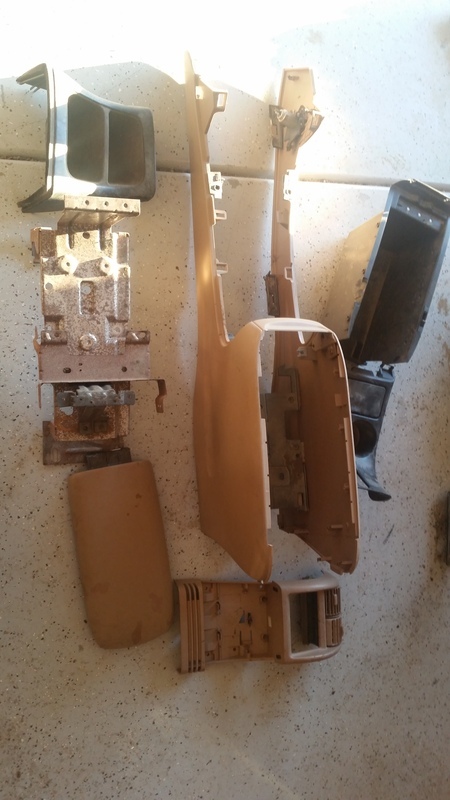 @Viper2172: Is Prairie Tan the color you are looking for? My son (TheArcticWolf1911) has one in perfect condition he would probably sell if Prerunner-Ranger doesn't respond back to you. His is Prairie Tan also. I bought the armrest lid for him as a Christmas present and gave over $50 for just that piece... but it was perfect. Anyway, if you are interested, I will get my son involved. Sorry for the delay in posting back... Christmas got in the way. Anyway, my son would sell his for $125 plus actual shipping. One thing about his console: he installed an LED light in each side as courtesy lights, which you would have to wire into your dome circuit or a switch. Optionally, you could pop in a couple of hole plugs instead, but the LED courtesy lights are pretty nice to have. Just let me know if still interested and I will get you two together. My interior is grey in color, so it would have to be painted. No worries on the delay, I understand completely. Please send me detailed photos of the console. In the meantime, you guys can check on shipping to 36330. Ah, your interior is grey. Now, I just want to put this out there: the main body of the console can be painted easily (I did mine and it looks beautiful). 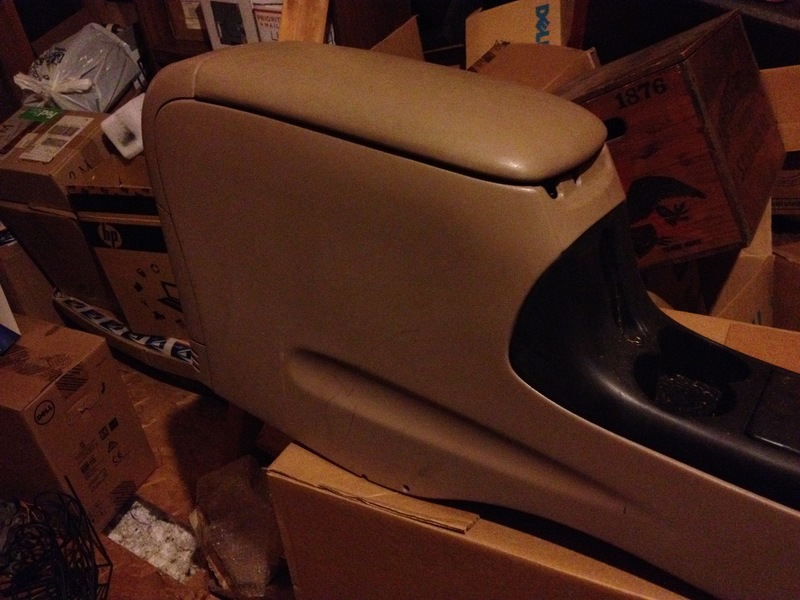 However, the armrest lid is made of leather/vinyl (not sure which) and it flexes when you lean on it. I am not sure how paint would hold up on that, so you might want to give that some thought first. For the record, I used some SEM color coat on mine and painted the tan lid black. It is a good flexible coating and held up well. Actually, it's still holding up for the guy I sold my console to. Just need to wipe it down with a good wax and grease remover first. We will have to dig the console out of the attic to get you some pics. I covered my lid with a nice cover I bought on eBay for $20.00. Now, we do have an alternate lid that needs a new cover that I'd be happy to provide you with instead, rather than tearing up a perfectly good one. It also does have a functioning blower motor inside, but if you don't want the motor I would be more than happy to remove it as it does drive up the weight substantially. Yes, it has been installed. I originally installed it in my '99 Ranger. Eventually I opted to install a different console for no other reason than because I wanted to. 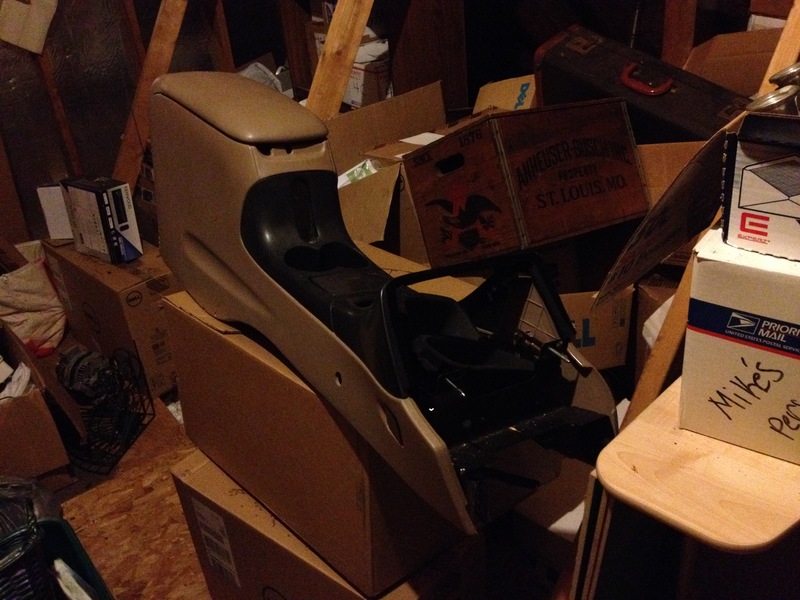 It has not been cut out for the gear shifter, but doing so isn't difficult if that's what you have in mind. Would you like the blower motor as well? The weight will drastically effect the price of shipping. EDIT: I didn't utilize the explorer hardware for my install. Doing so would raise the console and make it not look quite right, since the floorpans are different. The piece I'm refering to being the metal bracket which the console slides into. My father installed his a different way, and it's much more solid than the traditional mounting. 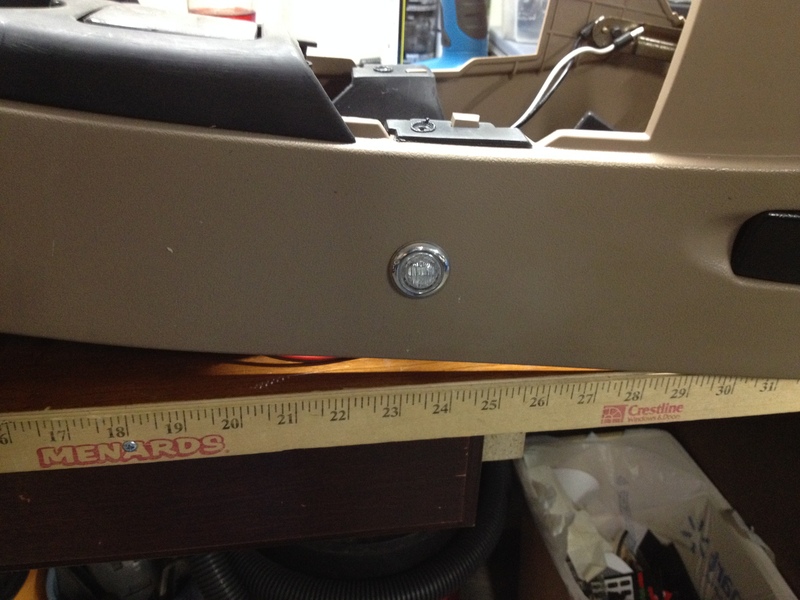 I'm struggling to remember the way this generation of console is put together, but I remember he installed his simply by bolting the main frame of the console (rear metal 'skeleton') directly into the floor pan after some measurements using long screws, washers, and nuts of course. I believe 1/4-20 is the size he used. Two or three bolts total were used, if I recall. Hopefully he will chime in to correct me if I'm wrong. I mounted my 3rd gen in much the same way, only instead using 6 total bolts due to the different design. Differences aside, I can attest that this is a very solid way to mount it and virtually no creaking occurs. Not to mention it is very solid. However, if you'd prefer the floor hardware instead, I'll scrounge around (now that I actually can) and find it. Fairly certain I have the floor bracket, although it's a very simple design if you wish to fabricate the piece instead. 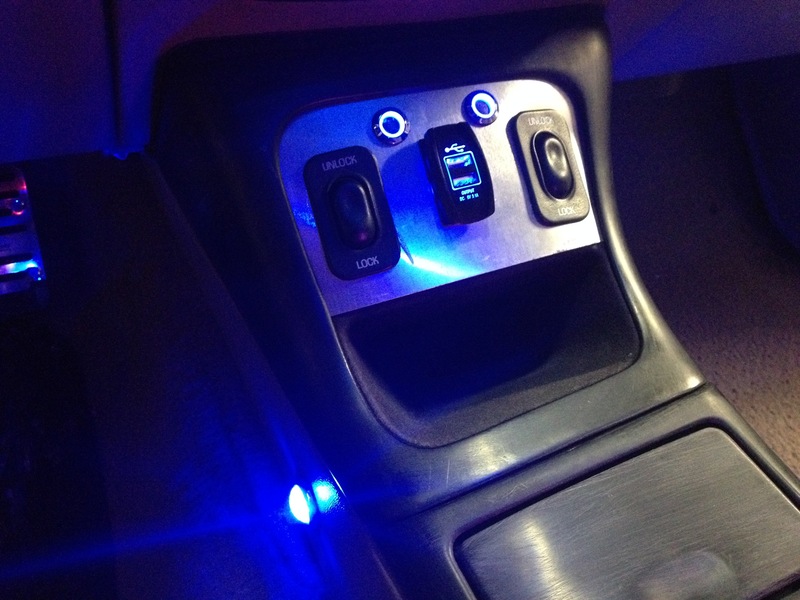 The bolts which pull the console up to the dash will also be included, of course. Also, you may be interested to know this console does have two custom features. 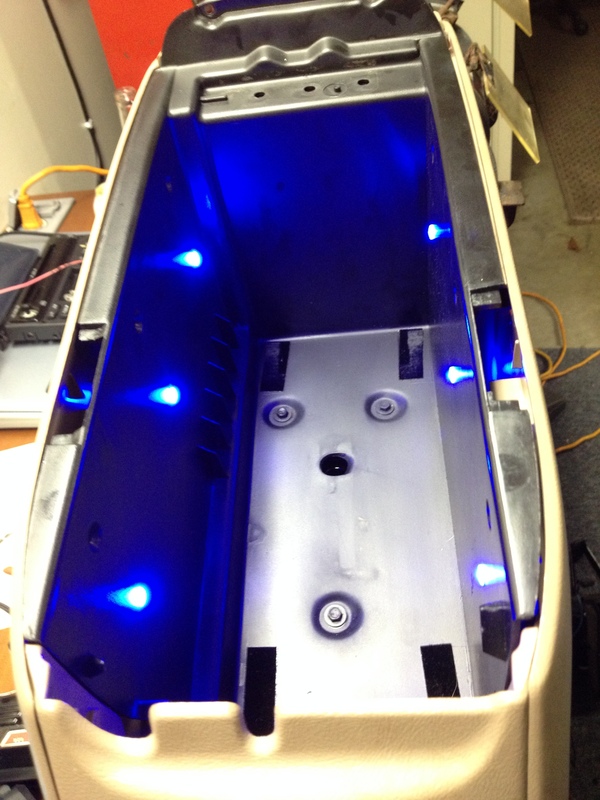 On the inside are six LEDs (three on each side) which illuminate blue for seeing inside the console at night. These can be wired straight to 12 volts. In the ash tray is another LED (color shifting) which can also be wired straight to 12 volts. Of course if these features don't interest you, they can just be left disconnected. Last edited by TheArcticWolf1911; 01-13-2017 at 08:52 PM. I mounted my console using 6 bolts total. 2 in the rear, 2 midway (under the cup holder/ash tray) and the two at the front that bolt to the dash. I would strongly recommend NOT using the standard Explorer mounting, as it makes the rear much too high and unstable. Actually, I think we tossed those brackets when we cleaned out the garage last fall. No, don't need the blower motor. Let's keep the weight down. Do you have any pics of your install? Any details on how it was installed would be great. You're very welcome. I will dig around in my pictures and see what I can come up with. I'll get to removing the blower motor. that thing probably weighs 30 pounds, lol. There are some photos of the install. Note that the switch panel doesn't come with it, nor the parts installed into it. The holes in the side, as seen filled in the last picture, are sized to install "3/4 grommet lights". These can be found online in packs in several colors and styles. On monday I will see about shipping. Well, monday has come and almost gone. Unfortunately with the rain (and my open bed) I was unable to take the console outside. If tuesday is dry, then I'll try then. Without a bed cover I'm at the mercy of nature. No worries, I'm not in a big hurry. 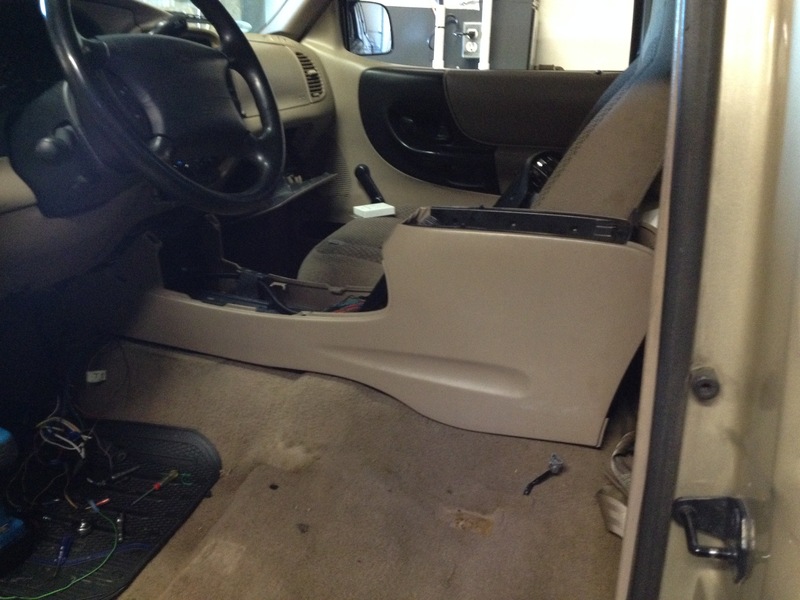 The carpet is pretty nasty, so I have to pull the seats and try to clean it really good and hopefully remove the stains up by the shifter. Alright, the console has had it's blower motor surgery, so now it's ready to be weighed. Since it's not raining, I'm going to head on over and get a quote. I've also attached a grey lid that, structurally, is perfect, but needs to be recovered. No sense in ruining good parts. Just got back from my local shipper(?) and they quoted me $60 to pack and ship the console to your zipcode. One thing I had forgotten about, however, was that the screws which hold the cubbies to the actual piece that snaps in are sadly, stripped. However this can easily be solved with either plastic epoxy OR a fiberglass patch kit. I'd recommend the latter. I patched a hole in my bed with a fiberglass kit and it's still going strong. Given so, if you'd like to haggle a bit I have no issue in doing so. Cameron, don't I have one in my spare parts? @Viper2172: Do you have automatic or manual? If you have manual, then the screw holes wouldn't matter anyway.